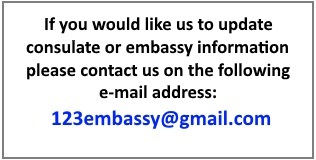 - For visa applications, passports and other consulate matters please contact the consulate directly. - Before you visit the consulate, make sure that you first check if you need an appointment. - Some consulates are honorary consulates and do not handle visa or passport matters. Inquire the consulate in directly or visit the official website. www.consulate-new-york.com is not related to any foreign consulate in New York.